Kathy McCabe is the host and executive producer of the travel series Dream of Italy now in its second season airing on on PBS stations, CreateTV, PBS.org, the PBS app, YouTube and Amazon Prime. The television series , which airs in 95% of U.S. TV households, is inspired by the award-winning subscription publication and membership website, Dream of Italy, that McCabe founded in 2002. McCabe is widely quoted in the international media on travel and Italian culture. In season two of Dream of Italy, McCabe explores Venice, Bologna, Florence, Abruzzo, Basilicata and her ancestral hometown of Castelvetere sul Calore. In Basilicata, McCabe interviews Hollywood director Francis Ford Coppola in his ancestral hometown of Bernalda. Season one of Dream of Italy featured Tuscany, Rome, Umbria, Naples/Amalfi Coast, Piedmont/Lake Iseo and Puglia, and is also still airing on PBS and Create TV. She loves meeting colorful locals — chefs, artisans, historians — who are deeply connected to their land, carrying on and preserving the traditions of their ancestors. In mid-2019, PBS viewers will enjoy the special Dream of Italy: Tuscan Sun Special where Kathy visits author Frances Mayes at her home Bramasole in Cortona. Also in 2019, the Dream of Italy Podcast will premiere. Season three of the TV series is expected in 2020. McCabe has published more than 160 editions of the award-winning subscription newsletter/magazine Dream of Italy, helping thousands of people enjoy more authentic and rewarding travels in Italy. Dream of Italy has been recommended for its savvy travel advice by National Geographic Traveler, USA TODAY, U.S. News and World Report, Forbes, BusinessWeek and numerous other media outlets. McCabe has spoken about travel to Italy at the Smithsonian Museum, The New York Times Travel Show, The Philadelphia Travel Show and the National Italian American Foundation. 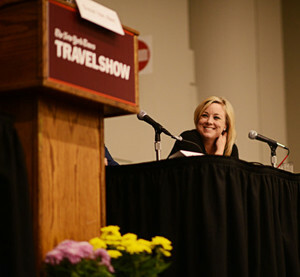 As a travel writer, McCabe has contributed travel articles to numerous other publications including Cruise Critic, Saveur, USA TODAY, Global Traveler, The Huffington Post, Budget Travel, Fodor’s Travel Publications, The Travel Channel Online, AOL Travel, The Baltimore Sun and The Boston Herald.